A well loved Polish Aunt gave Anna that first push she needed to make the dream of Polkadot Lane come true. From a young age Anna had always loved the cheese lady, it reminded her so much of the old Polish ladies working out in the fields looking after the animals, strong willed with the strength to cope with hardships that so many of the Polish women that she knew had to endure as a result of WW11. This was the tale of Anna’s mother and her beloved Aunt in Krakow. Seeing shops in London selling the Polish stoneware pottery she had fallen in love with and witnessing the pottery being used to its fullest capacity in the busiest oldest restaurant/hotel in Zakopane Poland – young staff dressed in Polish national costume hard handling the pottery obviously not their own – the seed was planted. It was beautiful it was strong and extremely versatile – a definite wow……. A visit to Poland in 2008, Anna’s auntie knew that the temptation to pass through Bolesławiec with a visit to the factories would be too much to resist. She organised meetings with the managers and then the story for Anna and Paul began. Liz – Anna’s daughter sent pictures of the couple’s kitchen window sill to Manchester markets who in turn invited them to attend their Christmas market in 2008. They needed stock – no problem. They needed a name and logo with meaning behind it and one that would be recognised. 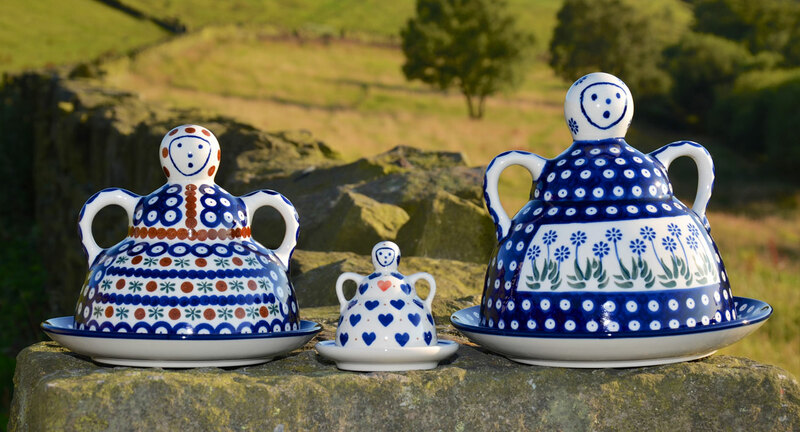 The classic polka dots of this pottery gave rise to the name, however it had to be – the word ‘Polka’ means ‘Polish woman’ – Anna has always regarded herself as Polish and keeps with the strong Polish traditions. The ‘lane’ relates to the windswept lanes where the couple live, with birds, seeds and flowers blowing down these well loved lanes. The pattern of the trees is from the ‘Wycinanki’ an old craft of coloured paper cut outs which are very popular in Poland. The debut of Polkadot Lane at the famous Manchester Christmas market 2008 was followed by shows and festivals where the couple wowed customers and organisers often winning awards for best stands. The shop in Hebden Bridge opened one year later and has grown from strength to strength with many famous visitors and customers delighting and cherishing their pottery. ‘It makes my heart sing’, ‘it makes me happy’, ‘I’m coming in for my fix’, ‘Our Christmas meal was a total success with the pottery’ are just some of the comments made by happy customers. The owners are more than keen to please their customers offering them a service not found in other shops or at shows they attend. They go out of their way to please and bring customers the product they have craved for. All our products are of the highest quality, unique and are extremely practical. The pottery is ovenproof, dishwasher, microwave, Aga and freezer-safe with a wide variety of patterns and designs to collect. Many of our pieces are individually signed and with some patterns 'Zastrzeżony’ (patent protected).